Throughout the United States, tipping is a practice that is considered a gesture of thank you for personal services. Since different people provide different levels of personal service for you, the tip will often vary depending on the person. To help you get a better idea of what price to tip, let’s go over some of the less-traditional personal service professionals that you’ll be tipping. A valet is a person responsible for parking your car at a fancy restaurant or one that has limited parking within walking area of the restaurant. A good valet is one who drives your car responsibly and is able to get it back to you quickly upon your departure. Valet tips should range anywhere from $2-$5, depending on expediency and courtesy. Hairdressers, also referred to as hair stylists, are a unique artist when it comes to your hair. If you’ve ever taken a look around at the hairstyles of others, it can be proven that all hairdressers are not created equal. Some know just how to make each client look flattering depending on their unique physical characteristics. Others may only be good at a couple of different looks. When you find a good hair stylist that you like, you should be tipping them around 20-25 percent of your bill. Just as finding the right person to style our own hair is so important, finding a pet groomer who can make your furry friend look amazing is also vital. All pet groomers are not created equal. There are some that can use the unique physical features of your dog to craft an eye-pleasing look. Others may only put forth the effort of a standard cut for your pup. If you find a pet groomer that makes your dog stand out in a good way, be sure to tip them at least 15-20 percent of the total grooming bill. We all know that it’s standard practice to tip delivery drivers. However, how many of you tip the cook or cashier when you get takeout? Think about the cook who did a great job to cook you up a delicious meal. Don’t they deserve some praise? Also, think of that support staff that worked to get it all packaged up and ready quickly. Carry out orders should receive a tip of about 10 percent of the bill. More and more restaurants are adding bathroom attendants to ensure that their stalls are kept clean and usable. If you’ve ever dealt with an unclean bathroom, then you can appreciate the job that the bathroom attendants do. It’s good practice to tip them $2-$3 for their services. In most cases, you can simply leave the money in their collection bowl on the counter. When you go into your favorite coffee shop to order your morning latte, there’s always that helpful person behind the counter greeting you. If you’re a frequent customer, it’s likely they already know what you want when you walk in the door. For this reason, you should tip the barista at your favorite coffee place at least $1-$2 each time. Getting your nails done is no easy task for your manicurists. They have to have a gentle touch with a steady hand to get that look just right. For this reason, you should really consider tipping your manicurist or pedicurists about 15 percent of the total cost of your bill. Tipping etiquette may be something that you’re not overly familiar with. It can be somewhat weird trying to figure out just who to tip and who not to. It’s always a good rule of thumb to tip those people who work in the personal services industry as they can bring their own flair to the jobs that they complete for you. 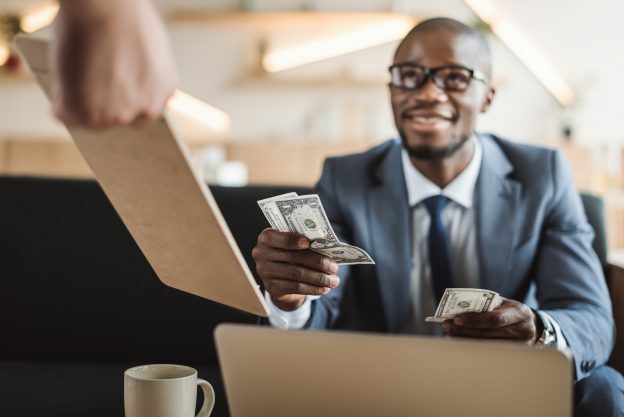 Check out Part One of our Guide to Tipping Etiquette, where we cover how to tip more commonly encountered service people, such as waiters, bartenders, and maids.